Maria Dueck Isaac and Bishop Jakob F. Isaac with sons Levi and Alvin, Meade, Kansas, 1941. Source:Centre for MB Studies (Winnipeg) NP139-01-71. Maria Dueck Isaac: minister’s daughter and bishop’s wife; born on 17 January 1898 in the village of Kleefeld on the West Reserve in Manitoba. She was the oldest of 13 children born to Heinrich R. Dueck (1873-1944) and Katharina Reimer (1878-1921). Maria was baptized into the membership of the Kleine Gemeinde on 23 July 1918 in Steinbach, Manitoba. On 6 December 1936 she married Bishop Jakob F. Isaac, a widower with 10 children. Together they had two children, Levi (b. 1937) and Alvin (b.1940). Maria died in Meade, Kansas on 10 March 1975. As a child Maria attended the village school in Kleefeld, Manitoba until the age of 16. 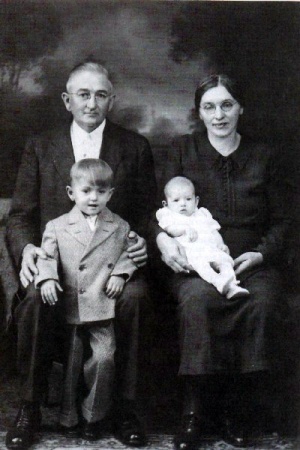 In 1921 Maria’s mother went into premature labor with her 14th child. Tragically both mother and child died leaving Maria, as the oldest daughter, in charge of managing the household and caring for her younger siblings—duties which she continued to perform even after her father remarried in 1923. In addition to being busy at home, Maria was involved in the formation of the Kleefeld Sewing Circle, of which she became the first official leader in 1925. With her father’s permission, Maria attended Winkler Bible Institute for two years starting in 1927. She was the first member of the Kleine Gemeinde to attend this kind of school. Upon her return home she was well prepared and eager to be part of introducing a Sunday School program into her home congregation. Maria taught a class of older girls, ages 12-16. When Maria decided to marry Jakob Isaac in 1936 she began a new life. Aware of the many changes she would have to face, she did not make her decision lightly. With courage and determination Maria was able to adapt to a new home, new responsibilities and a new family. When difficulties arose around Jakob’s leadership in Meade, Kansas, Maria suggested moving to Manitoba. In the end they weathered the struggles within their church in Kansas and Maria spent the rest of her life in Meade occasionally traveling to Kleefeld, Manitoba to visit family. Maria was faithful woman, gifted with intelligence and a desire to serve. Her nurturing influence in the lives of so many people and her ability to adapt to the many changes she faced throughout her life would be remembered with admiration. Dueck, Wendy. "Maria Dueck Isaac (1898-1975)." Preservings No. 10 Part II (June 1997): 47-49. Brown, Sharon H. H. "Isaac, Maria Dueck (1898-1975)." Global Anabaptist Mennonite Encyclopedia Online. June 2006. Web. 18 Apr 2019. http://gameo.org/index.php?title=Isaac,_Maria_Dueck_(1898-1975)&oldid=92119. Brown, Sharon H. H. (June 2006). Isaac, Maria Dueck (1898-1975). Global Anabaptist Mennonite Encyclopedia Online. Retrieved 18 April 2019, from http://gameo.org/index.php?title=Isaac,_Maria_Dueck_(1898-1975)&oldid=92119.